by Mitchell Leisen. 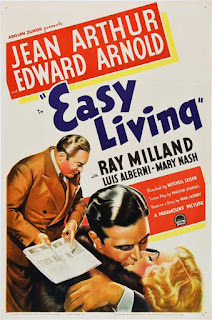 Jean Arthur stars as a poor working girl whose life is turned upside down when a sable coat, thrown from the penthouse apartment of financier J.B. Bull (Edward Arnold), lands on her head, ruining her hat. Bull lets Mary keep the coat, leading gossipers to assume that she is his mistress. 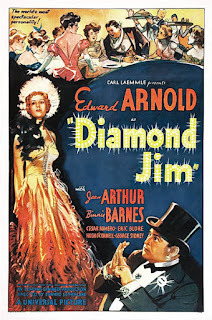 The plot begins when J.B. Bull finds out that his wife (Mary Nash) has purchased a $58,000 (almost a million dollars today!) sable coat without letting him know about it. In frustration, Bull throws the coat off of his terrace. The coat floats down and lands on the head of Mary Smith (Arthur) while she is riding to work on a double-decker bus with an open roof. Startled and confused, Mary goes door to door looking for the coat’s owner. While she is doing this she runs into Bull who lets her keep the coat (she has no idea it’s sable)) and offers to buy her a new hat on his way to the office. The hat shop proprietor, Van Buren (Franklin Pangborn) starts the rumor that Mary is Bull’s mistress. The rumor is passed along to Mr. Louis (Luis Alberni) the owner of the Luis Hotel, which is about to be foreclosed on by Bull. Before you know it, Mr. Louis is offering Mary a suite in his hotel as a way to promote it. Meanwhile, Mary is completely oblivious to the ramifications of her new circumstances. She’s even ignorant of the fact that she’s been dating Bull’s son, John Ball Jr. (Ray Milland). Things get more complicated and hilarious with each passing moment. 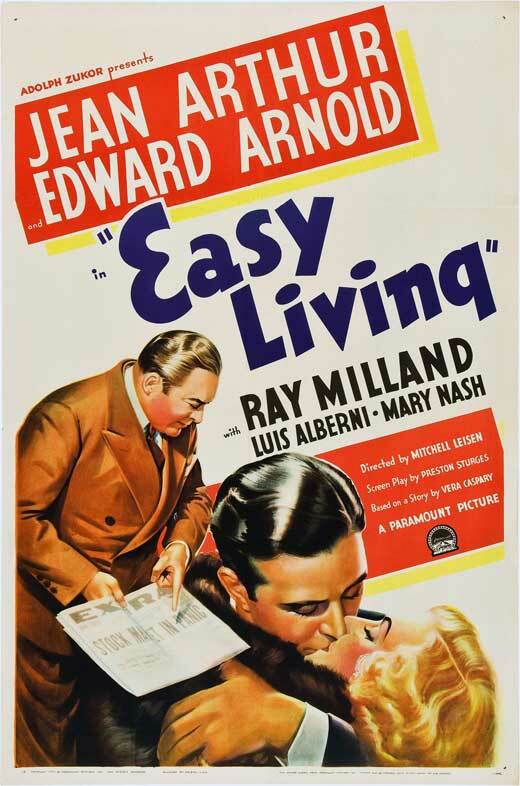 Easy Living is the second screenplay written by Sturges that starred Arnold and Arthur. 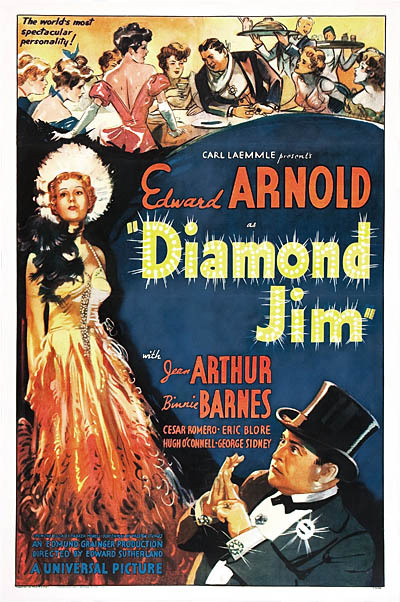 Diamond Jim featuring both stars was penned by Sturges two years earlier.